Before leaving Ireland for Madeira the boat had only been sailed ten houers. Some people think thats to little. However the conditions in the Baltic does not make a good test ground for a deep water boat. For me the testing was done on the Bay of Biscay. The boat is more than enough safe. She is very strongly built. She got good hatches and a good heavy weather ventilation system. The disadvantage of testing the boat in the Atlantic is that it is far from my workshop. Still I was learning much. I already knew that the boat was to heavy and that I wanted to build a new one. The offshore milieu is very inspiring and I have created a fantastic new design, something I do not think I cold have done ashore. 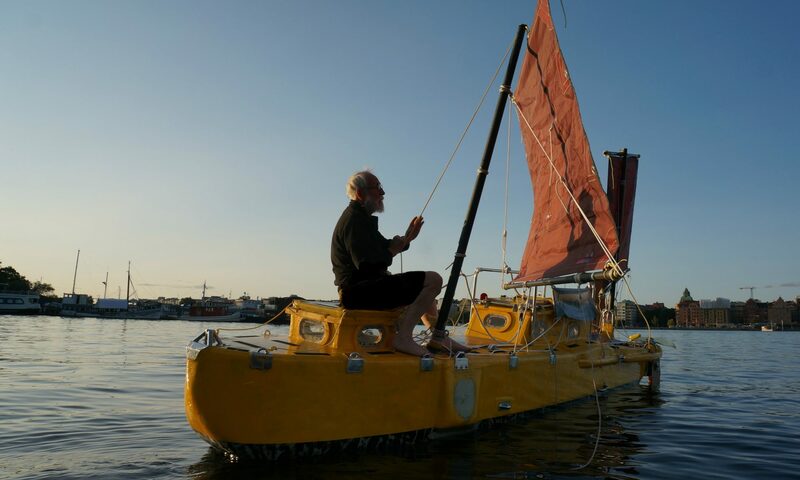 Like my previus boats I was able to make YRVIND.COM selfster without windvane or autopilot. Previus boats I have succeded with are 40 feet DUGA, 20 feet BRIS, 19 feet aluminum BRIS, 15 feet amfibius BRIS and 27 feet MAJA a production boat. In fact when leaving Kinsale in Ireland a boat gave me a tow out of the harbour. When he had let go of the towrope and I had got up the sails YRVIND.COM just keept sailing strait if I remember right for about three days or more. the course was hard on the wind. The easiest, but even on other courses like downwind i very light conditions I had ny problems to make her keep her course.